The kit comes with everything you need - I used the dressing as a base to make a quick and flavorful peanut sauce to slather on the dough pre-bake and to drizzle on top of the finished pizza. Oh my goodness is this pizza delish! 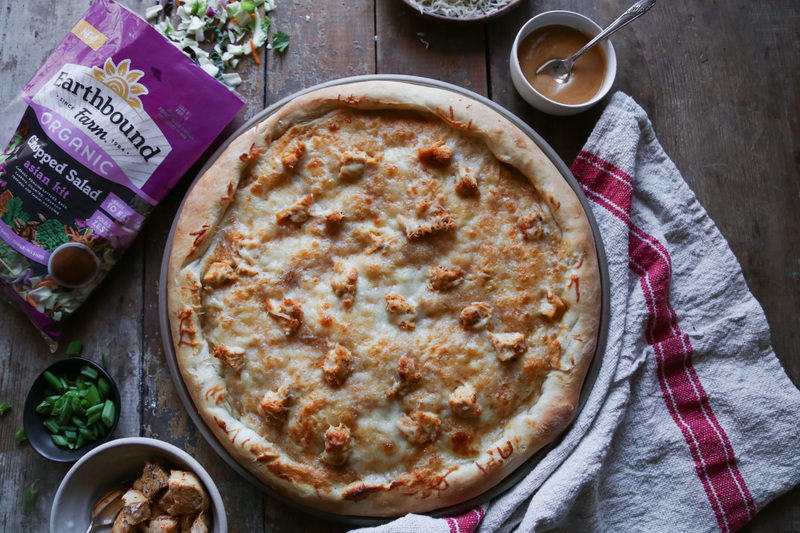 But really, how can you go wrong with soft pizza dough, melty mozzarella, flavorful chicken, a crisp blend of veggies, and a sweet and tangy peanut sauce? Trust me when I say that it all works together to create one amazing meal! Their salad kits come in other flavors too, like Southwest and BBQ Ranch! I’ve tasted them all and they’re all equally delicious! Wouldn't a BBQ Ranch style pizza be amazing?! Begin by making the crust. I use Rapid Rise yeast to cut the rising time down. If you are using regular active dry yeast, you'll have to let it rise a bit longer. Place 1 cup of flour, rapid rise yeast, oil, honey, and salt into a large mixing bowl. Slowly add your warm water and begin mixing with an electric mixer or wooden spoon. Beat until the mixture is smooth, about 2-3 minutes. Begin adding additional flour ½ cup at a time until it forms a soft dough. Place dough onto a lightly floured surface and knead for 5-7 minutes or until dough is soft and smooth. Be careful not to add too much flour or the crust will be hard. Place dough into a lightly oiled bowl and turn to coat. Cover the bowl with plastic wrap or a damp kitchen towel and let rest in a warm place for 20 minutes. If using active dry yeast, let rise about 60 minutes. Make the sauce by combining the Earthbound Farm Chopped Asian Salad Kit dressing packet with peanut butter, honey, sriracha, and 2 ablespoons of water. Beat with a hand mixer until creamy. Set aside. Preheat oven to 450ºF. Place dough onto a lightly greased pizza pan or cookie sheet and gently stretch it out to about 12-14 inches, but be careful not to overwork the dough. The size will determine how thick or thin the crust is—smaller pizza for thicker crust, spread it out larger for thinner crust. If you get a hole in the crust when stretching it out, just pinch the dough back together. (Optional: For thick, fluffy crust, you can cover the dough on the pan and let rise again for 15-30 minutes) Spread 1/4 cup of the Asian peanut sauce over the crust and top with cheese and cooked chicken. Place pan into the preheated oven and bake for 10-15 minutes (time will vary depending on how thick the dough is) until cheese is melted and crust is golden brown. If needed, mix 1–2 additional tablespoons of water into the remaining Asian sauce until it’s thin enough to drizzle. Remove from oven and let cool slightly. 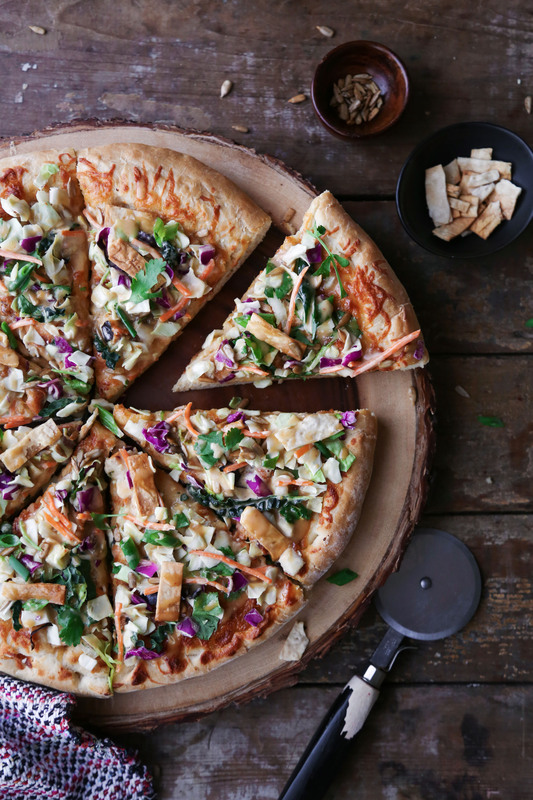 Top pizza with Earthbound Farm Asian Chopped Salad, the crunchy toppings, and drizzle with remaining Asian sauce.